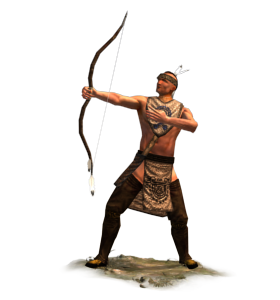 The bow is a tool as well as a weapon, used for providing food and defending the tribe. In the time it takes a musketeer to fire and reload, a skilled bowman can loose several arrows making them formidable enemies. Tribesmen hone their skills daily, hunting to provide food for their families and furs for trade with Europeans. The materials used to make a bow vary from tribe to tribe. Some are made from wood, others from the horn of elks or mountain sheep. Bowstrings are sinew or rawhide but, in an example of using whatever is to hand, the Dakotas are reputed to use the necks of snapping turtles! A large area inhabited by a variety of wild animals hunted for their meat and pelts. A formal training area for tribal warriors to perfect battle skills and learn necessary discipline. Horses are incredibly valuable and those who look after them command great respect. A lodge set aside for warriors and the elders of the tribe to discuss matters of importance before deciding policy. An open space for warriors to practice horsemanship, break in and train horses, and practice basic cavalry tactics. A gunsmith is an indispensable asset with the skill to produce and maintain firearms. A sacred site where a tribe can honour its fallen warriors for all time. A place to honour the dead and pray to them for advice and guidance. An area of great power and energy; used for a variety of rituals, including the rain dance and ghost dance. An area of great spiritual power respected and honored by all. A gateway to the spirit world, controlled by a shaman or medicine man. Keepers of wisdom, the Council of Elders see to it that their people’s way of life is respected and continued. Home to the Chief of a tribe; where all can come for help and advice from their leader. This is a permanent meeting place for peoples who share beliefs and traditions.